Set in breathtaking natural surroundings in 25 acres of Coconut Palm groves and separated from the sea leading down to the vast expanse of beach. The Marari Beach is a Brand New hotel .built in the style of traditional fishing village. It is 14 kms away from Alleppey & 90 kms from Cochin International Airport. 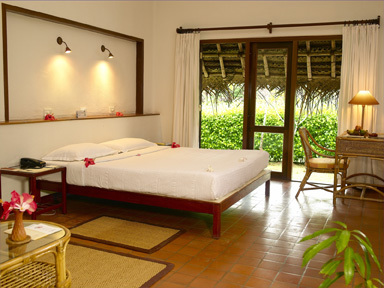 The hotel has 62 beautiful thatched villas with 49 garden villas, 10 pool villas, three deluxe pool villas. Each villa also has a small exclusive garden area. There is a large swimming pool with sun terrace near by main restaurant, bar and an amphitheater where cultural shows are performed. The “beach-shack” set amongst the Coconut Palm fronting the beach serves delicious sea food. 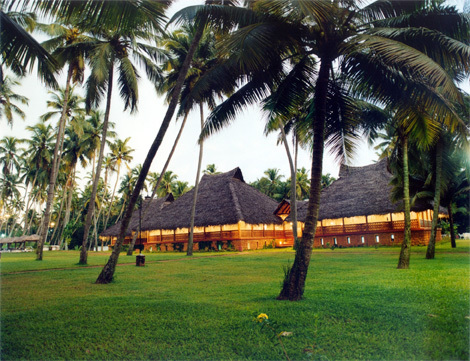 Hotel restaurant A Wickerwood-roofed, open-sided Malayalam building has a superb buffet with a vast selection of Keralan vegetarian, fish and meat starters, mains and desserts with some Western dishes. The beach restaurant serves sumptuous fresh fish. The resort runs its own Ayurveda Center headed by the senior Ayurveda Doctors and a team of dedicated messieurs staff and therapists. For this purpose you may avail the facility of Beach Cots and Cozy Hammocks in the grove .The Beach Volleyball ” court ” is a fun place to organize a friendly match to enjoy adventurous tour , bicycles are available at the reception to explore the neighbourhood.